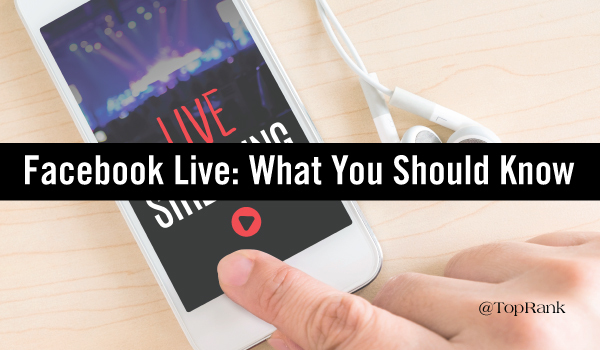 Right now, the easiest way to go Live is from a mobile device. On the Facebook app for iOS or Android, you’ll see a “Live” button right at the top of the feed. Click that for a quick set up and your feed will begin! There is a version of Live for desktops which is slowly being rolled out—if you don’t have it yet, the mobile version is the only game in town. Since it’s so easy to go Live, a lot of Live streams right now look the same. They’re talking heads, people holding up a phone and chatting informally with the viewer. If you’re a celebrity with a quick wit, go for it—otherwise, don’t go in without a plan. It’s an unpredictable platform—you may have to contend with technical issues and an unmoderated comment stream at the same time. It’s a good idea to have at least one person off-camera who can handle the comment stream and work out any glitches. Finally, don’t expect your entire audience to tune in all at once. Generally viewers drop in and out of live streams—some will arrive late and some will leave early. So a complex narrative that builds on prior knowledge is not the best choice. Behind the Scenes: Dunkin’ Donuts took their followers on a tour of “Dunkin’ Brands University,” a facility where Dunkin’ creates new products. At the end of the tour, audiences got a tutorial on how to make a Dunkin’ Donuts wedding cake. The tour scored just over 30,000 views.The informal, intimate nature of the platform is ideal for these sneak peeks behind the scenes. If your brand doesn’t have a factory to tour, consider a tour of the office space itself—promote transparency and your corporate culture by showing off work spaces and interviewing co-workers. Performances: If your brand can swing it, musical or dance performances are a great way to pull in top-of-funnel audiences. Postmodern Jukebox is my favorite for performance video—they livestream parts of every concert they put on, often capturing behind-the-scenes content as well as the concert. But you don’t have to play at that level to stream a performance. Buzzfeed’s interactive dance-off was compelling to viewers because it was an amateur, interactive event. Wow, good to hear! It’s definitely got a ton of promise. Thanks Joshua … for all of the information in this post. We will definitely be sharing these insights with our clients. Really helpful for marketers.